Wages earned by J-1 employees have always been taxable for Federal and State income tax but exempt from Social Security and Medicare. 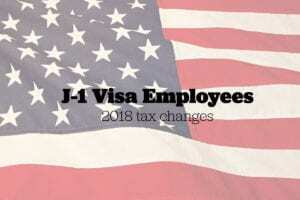 As a result of tax reform in 2018, there is no longer a personal exemption for J-1 employees. Prior to 2018, the personal exemption was $4,050 meaning that J-1 employees did not pay income tax on the first $4,050 that they earned. Starting 1/1/2018, there is no personal exemption so J-1 employees start paying income tax with the first dollar that they earn. J-1 Visa employees should follow the special instructions in Publication 515 when completing their W4. Here is a link to the IRS web site discussing international taxpayers. On this page you’ll have easy access to links to download the forms you need and instructions for you and your employees. Here is quick video from Sprintax that also explains J-1 student tax obligations. We are not affiliated with Sprintax.